Something that kind of blows my mind and that I would be thrilled to find at any wedding is the Cheesecake Wedding Cake. A wedding cake made entirely of cheesecake. I’ve mentioned before that my inner-Golden Girl would SO have a field day with this option. However, I felt like it was sort of a long shot. I know cheesecake is a little pricey and I could not even begin to imagine how much a Cheesecake Wedding Cake must cost. I was pretty pleased to find out that a.) they do exist and b.) you will not have to sell your first born in order to pay for one. Cheesecakes freeze pretty well but generally don’t last for up to a year. Therefore you don’t have to pay for that extra top tier. Also, cheesecake bakers are aware of this and I have seen quite a few bakeries who offer a free cheesecake on your one-year anniversary when you order your wedding cake from them. Pretty awesome yes? Also, another plus is that a cheesecake wedding cake can pretty much resemble a typical wedding cake. Bonus! Won’t your guest be surprised when they bite into a fluffy and rich cheesecake instead of a flour cake like they were expecting? The next option doesn’t travel too far from the Cheesecake. In fact it has the same name. It’s the Cheese Cake. 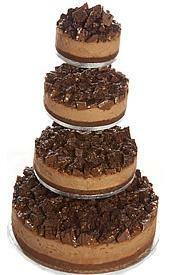 Or the Cheese Pause Cake as I like to call it. So far we’ve featured three on this blog and that is three more than I ever could have imagined. The Cheese Pause Cake usually consist of placing various wheels of cheese on a gorgeous cake stand and serving with fruit. This is even an option that could be done during the cocktail hour of a wedding and you could still have a traditional cake. Check out this gorgeous cake that we featured last month. 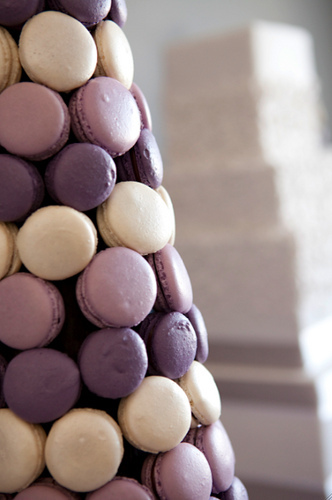 A trend that I have seen emerge this wedding season is the Macaron Tower. Macarons are small meringue cookies that are usually flavored in almond. The best part about these cookies is that they can come in a variety of bright fun colors that can match any wedding pallet. I have seen macarons served as favors in the past but recently Macaron Towers like the one pictured below have been popping up in wedding photo shoots. Seriously, go google “macaron” and look at all the bright and colorful images that pop up. Sometimes I dream in Doughnuts. It’s true. I love doughnuts so much it hurts. You could in fact say I prefer them to cake. That’s my shameful secret. I google Dunkin’ Donuts or Krispy Kreme locations whenever I am on vacation. By the way, Dunkin’ Donuts people if you are reading this, you need to build more locations in Columbia, South Carolina. Just sayin’. 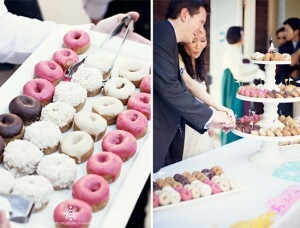 When I saw this adorable photo shoot by Divine Order Photography of a wedding in San Fransisco, I knew I had to feature doughnuts. The couple chose a tray of organic doughnuts, with the glaze tinted to match their wedding colors, and a cake stand of mini-doughnuts in lieu of the traditional wedding cake. They even topped off their “cake” with a bride and groom topper. You can choose to class it up with custom made doughnuts but I even think a nice selection from your local doughnut shop on a pretty cake stand could make such an impact. Oh my, oh my..what about serving little tiny pies? I love pie. Not more than cake but pie is good and it comes in SO many different flavors. My favorite is Chocolate. That’s not much of a shock. I love the picture below because it gives the option to have many different flavors of pie and allows your guest to choose which one (or two…or three) they’d like to sample. You can also do larger pies as well. I think pies would be especially adorable at an outdoor low-key summer wedding. Can’t you just see a table full of yummy strawberry rhubarb and banana creme pies on an adorable printed table cloth? The world is pretty much open to whatever tickles your fancy. So if you don’t like cake–don’t fear. You have many more options that those I have told you about today. What about cookies or truffles? Are sweets not your thing? Then fruit might be a good option. Whatever you choose it’s up to you…because after all it is your wedding! 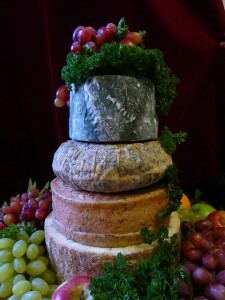 Have you been to a wedding with a non-traditional wedding cake? What would you think if you went to a wedding where there was no cake? 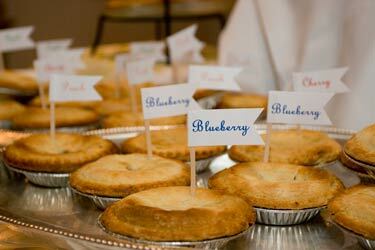 Most importantly, what is your favorite flavor of pie? Go ahead and tell me in the comment box…I love hearing your thoughts!